I don't wear suits much. I've only bought a total of two suits in my life. I didn't do a very good job buying either. The first suit I bought in the early 90's after I graduated college. I bought the suit to do job interviews. I got it from a Men's Wearhouse. I don't recall what I spent but I'm pretty sure it was under $200. It was a good suit. BUT ... the style of the suit was a trendy fashion with shoulder pads, pin stripes and it was double breasted. In the early 90's that looked perfectly normal, but today it looks horribly out of date. That first suit worked fine initially, but now years later its not something I'd want to wear. The second suit I bought recently. I bought the suit the day before I had to go to a memorial service so it was a last minute kinda purchase. I didn't get much advance notice about the memorial service and I didn't have much time to fit in the shopping, so this wasn't planned of course. 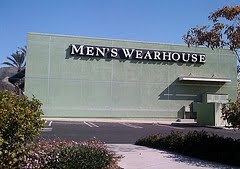 Again I went to Mens Wearhouse to buy it. When I was driving there with my wife, I had in my head that I didn't want to spend more than $200. I initially figured I might just buy a jacket that I could wear with some dress slacks I already had. When we got to the store the first suit the buy put me in had a price tag of about $500. I failed to state up front what my price range was so of course the salesperson goes straight to one of the more expensive suits. I told him that was too much and asked for something closer to $200 level. I then tried on 3-4 more suits in the $200 range and finally found one that fit me well. I also tried individual jackets but decided to go ahead and just get a full suit so I'd have it to wear if or when I needed. I figured why spend $100 or so on just a jacket when I could go ahead and get the full suit. I finally settled on a suit for about $230. Not too far above the $200 I initially figured on spending. Not so fast! When they're fitting the pants I find out its an extra $22 more to have the hem done. So now its actually $250 I'm spending. Guess what! They are having a sale right now and if you buy one suit you can get another for just $100. That actually sounded like a great deal. And I still do think it is a good buy. However I resisted the temptation to spend more money because I barely need one suit, much less two suits. Sure $100 more for a 2nd suit would be a good buy but I don't need a second suit. Bullet dodged. ... for a moment... the salesman was good. He suggested that I could get a nice sport coat and my wife really liked that idea. We'd actually talked about me getting a decent sport coat that we could wear on nice dates and such. Something formal but not overly dressy like a full suit. So this is something I had wanted to buy. Ok, so now I'm buying a suit AND a sport jacket. Thats not too bad. Guess I'm spending over $300. However we're not done yet of course, you can't forget the accessories. I'll need a dress shirt and a tie of course. The salesman shows me a very nice shirt with some sort of fancy features like stain resistance, wrinkle resistance and whatever, but the price tag is around $50 for that shirt so I decline and ask for something cheaper. Getting a tie is a matter of taste so I end up buying one of the tie's that I like for something around $15 or $20. If I add this all up in my head I think I'm at about $360. The salesman suggests some dress shoes, no thanks I've got those. He asks about socks, no I've got socks. I'm surprised he didn't try to sell me a handkerchief, cuff links and some cologne too. The very last attempt on the salesmans part to increase his commission was to pitch me the $10 cedar hanger. 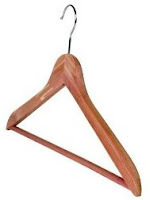 That is a clothes hanger made of cedar wood in order to keep the moths out of your suit. No thanks. (after the fact I found cedar hangers online $11 for 5 pack). Once everything is wrung up at the cash register the final bill is $391 and change. As I'm paying about 100% more than I intended to for the day's shopping I at least congratulated myself that I didn't fall for the $10 hanger. That is the conclusion of my long example of how NOT to buy a suit. Maybe next time I buy a suit I'll do a better job. Below are some things I've learned about the process that would help me pay a bit less hopefully. Buying a suit at the last minute doesn't give you time to shop around and look for bargains. If you're buying at the last minute you are stuck taking the quick and easy option which usually isn't the best value. You don't know when you'll need to go to a funeral or some other occasion that requires more formal attire. If you buy a suit in advance of when you actually end up needing it then that will allow time to shop around and find a good buy. If you know you'll need a suit sometime in the future for a wedding, unexpected funeral or other event then buy one in advance so you have plenty of time to shop around to find a good suit or wait for a good sale without being rushed to make a decision. Don't go into the store without a solid idea of what you need and want to buy. I went into the store without really thinking if I wanted or needed a dress shirt, tie, shoes, etc. I just had a vague idea of needing a suit or maybe a jacket but without any detail. You should figure out before hand exactly what you want to buy so you aren't stuck making decisions on the spot about the various accessories or buying something you didn't really need or want in the first place. Don't let a salesman guide you into purchases that you don't want or need or out of your budget. I did not need an extra sport jacket but I ended up buying one anyway. I wanted one but I didn't need one that day. I could have just said no thank you on that one and shopped around more to buy one at another time. Buying it then and there was more of a "why not" ... or "might as well, while we're at it" purchase. DO shop around for accessories. I'm pretty sure that Mens Wearhouse has a very large profit margin on their accessory items like the dress shirts, ties, socks, and cedar hangers. If I had the time to shop around for these items then I am sure I could have gotten them cheaper elsewhere. The first suit I bought back in college was a good suit at the time. Now it would make a good Halloween costume if someone wanted go go as "90's Man". If you need a suit then buy one in a classic fashion that won't go out of style in a few years. That way your suit will last you years or even decades into the future. My father has a suit he bought in the 1960's that still looks fine today. I do not regret my suit and jacket purchase. Please don't read this story as a negative review of Men's Wearhouse. I actually quite like Men's Wearhouse and was very satisfied with the good work the salesman there did and I'm happy with the suit purchase. I don't think $391 for what I bought was a bad price. I could have gotten it cheaper if I'd shopped around a bit I'm sure but I didn't have time to do that. For a last minute purchase I am happy with what I got. I knew at the time that I was paying a bit more since it was a last minute purchase. Its a good suit I'll be able to use for years.